While I wasn't around back then, the multiple colors this drop makes me think of the White Skull drop with the various flavors of Glyans. I've been racking my brain since seeing the post last night, any Marvel nerds out there? 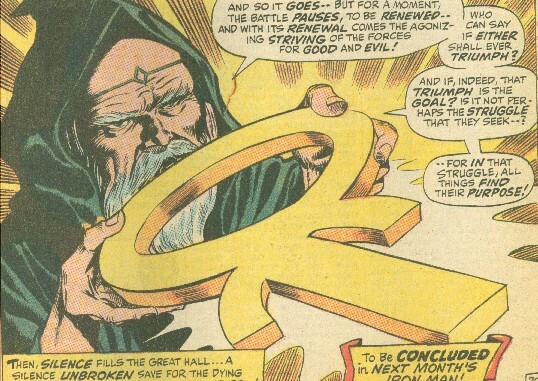 That symbol vaguely reminds me of the Zodiac Key from Nick Fury's villain Scorpio. NoPaintRequired wrote: While I wasn't around back then, the multiple colors this drop makes me think of the White Skull drop with the various flavors of Glyans. Lazzy Lizard wrote: Death to All Wallets!!! Also just occurred to me...what about vinyl?!? Witchwitchwitch wrote: I've been racking my brain since seeing the post last night, any Marvel nerds out there? 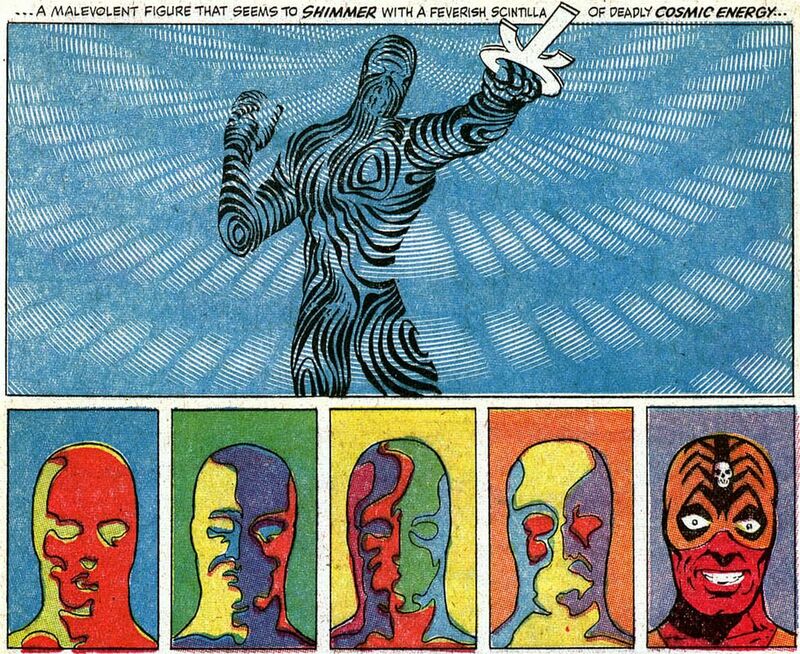 That symbol vaguely reminds me of the Zodiac Key from Nick Fury's villain Scorpio. Thank you! I've been trying to figure out why that shape was so familiar. Primary colors and a very light grey, an insignia that looks vaguely like a robot with a mono-eye, and something about colonies? Wild guess, but maybe . . . ? kranix wrote: Primary colors and a very light grey, an insignia that looks vaguely like a robot with a mono-eye, and something about colonies? If this is the case, I'll be so happy. 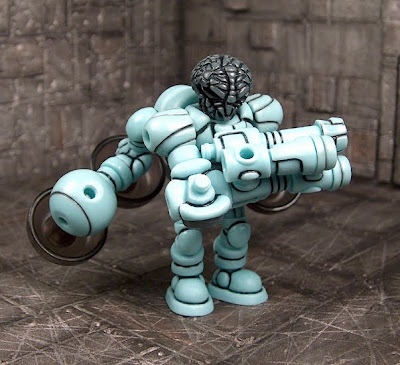 I'd love to see a Gogg Gobon or GM Buildman..
Update: Looks like Matt confirm vinyls are in the mix, Glyaxia Super Cray anyone? Rig Runner Racers? A Rush themed Pathfinder and Rockum Buildman MK2? Okay so that last one is more of a personal want. The new logo looks kinda like a LEGO Space helmet, no? It is to my great shame that I hadn't considered this before, given my other toy hobby. The name "Colonize" also fits with the Classic Space theme of lunar exploration. If this is true, I'm not missing this drop. From Matt in the comments: "Also, maybe something from the past to help things roll along." 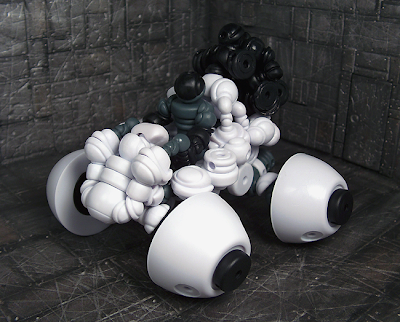 The wheels were long gone before I started collecting Glyos, would love a chance to add some to my collection! Also what do we think are the chances of a LEGO Space-style plante/rocket tampo on one or more of these figures...? Interestingly, Matt has confirmed that there won't be any crossovers in this drop. 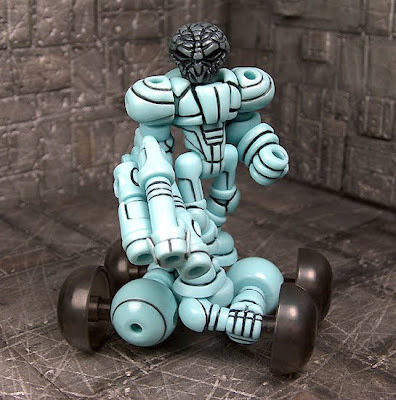 Robo Force would have been great for this, combined with the Wheels it would have made for some great vehicle builds. 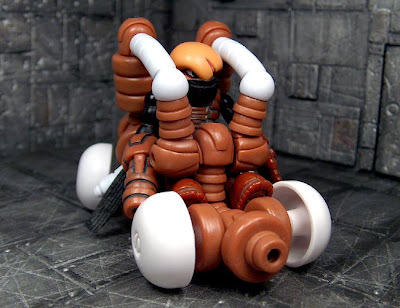 I'm skeptical of the Onell part library's ability to make a proper vehicle, although I've been amazed by the versatility of the Glyos system before so I guess we'll see when everything's revealed. There'll likely be a teaser picture tonight or tomorrow- Looking forward to seeing what the general designs look like. I realize that with no cross overs the Callgrim parts would be nixed but, here's a few examples of wheel builds/vehicles that I like. I think there's potential there, subbing a Glyan w/ various Onell parts. I still can't figure out what that insignia is supposed to be. It's bothering me. Those builds are brilliant! I love the platform/jetpack combo on the first one, and the ingenious use of the Gobon body for the second. 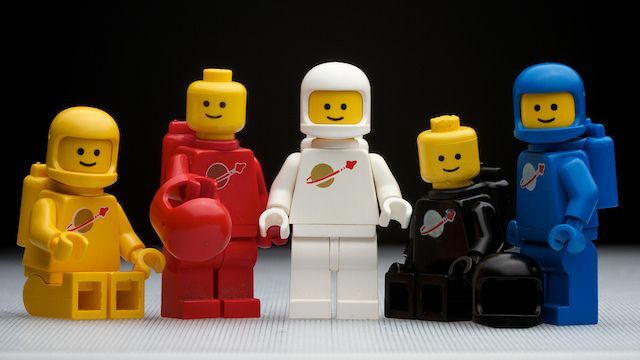 I was also thinking about the Lego Classic Space homage- I'm guessing we'll see DSGs with yellow paint on the visor, maybe a tampo for the face area? It's very likely that we'll see some Gendrones returning as well, robots were a big part of the line. Bring back the Neo Sincroid head and paint the face yellow! 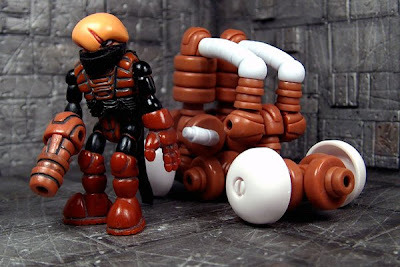 Messed around with Robo Force and wheels, but I have to say, it's harder to build than image. Most of the parts are really wide with the ports in the middle, even building off those ports in a pleasing design. This is just using a plain Robo Force kit, no axis joints, phase arms, or swing joints. akum6n wrote: Bring back the Neo Sincroid head and paint the face yellow! If only! Or all yellow Microshin head. Agreed. More pics please. I need a general idea of how broke this drop is going to make me.